If the material has a pattern, it is important to define its direction. Pattern direction determines the size of the blank and calculation of the blank in the optimal board cutting program. Usually, the measurement of length is provided in the pattern direction. BOMIZER plug-in automatically assigns the pattern direction according to the longest straight edge of the part. The user can change the direction by clicking the button . This button opens the dialog box used to edit the pattern of materials and overlaps for blanks. You will simply have to select part whose pattern direction needs to be changed. Briefly about the functions of the dialog box. 1. Here, you can specify the angle of the pattern in terms of the current angle. Keep in mind that when the pattern editing command is active, you can use the cursor to specify any straight edge of the part, according to which the pattern direction should be arranged. 2. The button determines the pattern direction by the longest straight edge of the part. 3. Setting the overlap of the blank to the right. 4. Setting the overlap of the blank to the left. 5. Setting the overlap of the blank up. 6. Setting the overlap of the blank down. 7. Setting the overlap up in line with the thickness. 8. Setting the overlap down in line with the thickness. 9. Measurements of the blank including overlaps. As outlined in the description, blank overlaps are given on six sides. For simple application, it is enough to specify the overlap in three directions: length, width and thickness. However, in the future BOMIZER will offer the opportunity to prepare automated numerical control programs. 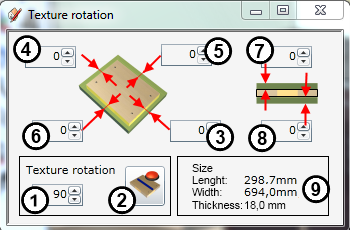 In the example, you can see how the pattern direction of the part is changed by specifying the direction of the edge, the rotation angle, by later restoring the pattern direction by the longest straight edge of the part, and, finally, by selecting the pattern direction, which is parallel to the horizontal edge of the part. The next example shows how you can assign processing overlaps of 100 mm on the selected sides of the blank.